This is the first of three sections which each serve as individual arguments: Drivers of Change, The Business Case for Climate Protection and Risk Mitigation. Feel free to use these three sections individually or together. The below table of contents is "click-able" if you wish to jump to different sub-sections on this page. One hurricane is not a trend. But as the impacts of global warming become more obvious, Mayor Hickenlooper’s reaction will become more common. And climate change is only one of the drivers facing us. This chapter discusses some of those drivers. They will bring change to your community whether you like it or not. These drivers may seem out of your control, but if you can understand the nature of them you can put in place the sorts of programs that can enable you to cope. Understanding these drivers can also enable you to create new businesses, reduce costs for existing companies and capture an array of opportunities that will arise in your community as the future unfolds. How larger forces may create opportunities that can enhance the success of your programs. Each of these trends is discussed in more detail below. When asked to name a global trend many people reply, “terrorism.” That is indeed a phenomenon of modern life. But terrorism is far less likely to impact you personally than an array of other changes sweeping the planet. Munich Re, the world’s largest reinsurance company, stated, after assessing the total insurance losses due to the September 11th events, that it is more concerned about climate change than future terrorist risks. This trend may be the central driver that led you to pick up this manual. A stable climate is of inestimable value to companies, to residents of cities and ultimately to all life on earth. Yet, we are losing this essential foundation of a successful economy. As the climate changes, the intensity and frequency of what have been considered “natural” disasters like flooding and hurricanes are increasing. The changing climate is forcing cities to deal with such acute challenges as storms, heat waves and water shortages. It also imposes a wide array of long-term impacts such as droughts, the spread of diseases and the demise of historically important industries. In December 2005, at the International Climate Conference in Montreal, Munich Re Foundation released figures showing $200 billion in weather related losses that year, breaking the previous record of $145 billion  in 2004. In contrast, the World Trade Center losses were less than $40 billion. The money paid out by insurance companies for weather-related losses in 2004 was more than double its payouts in 2003 ($65 billion) and more than four times its payouts in 2001 ($36 billion). This reflects the number of people at risk in storm-prone areas like coasts, and the increasing value of their property. But it also results from larger areas along and inland from the coasts experiencing more severe weather patterns that cause more extensive and expensive damage. Hurricane Katrina in August 2005 was only one of the catastrophic storms around the world. The frequency of major natural disasters is now three times what it was in the 1960s. CGNU, the largest insurance company in the U.K., forecasts that at the current rate of increase of the property damages, by the year 2065, the cost of these disasters will be higher than the entire world economic production. 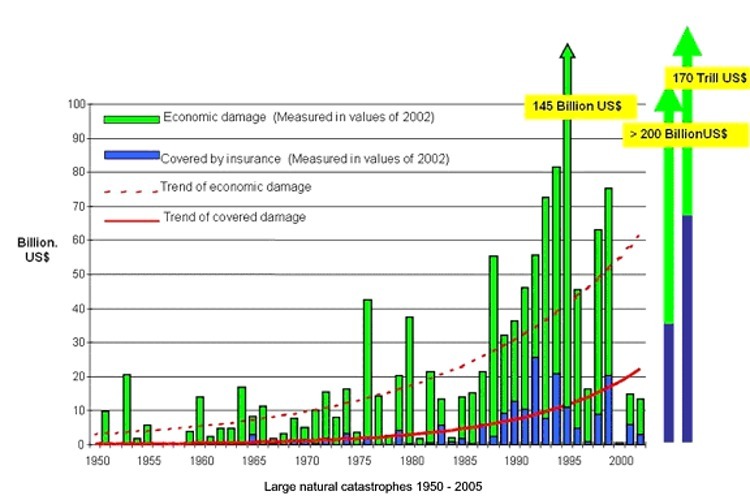 The following figure shows the evolution of the economic costs, and insured costs of natural disasters worldwide over the past decades. In 2005, insurers faced claims for seven of the ten most expensive hurricanes in history. In response, insurers like AIG, one of the world’s largest, announced that they would give customers who reduce their carbon emissions a break on their rates. National Oceanic and Atmospheric Administration (NOAA) Administrator D. James Baker says, “Our climate is warming at a faster rate than ever before recorded. Ignoring climate change and the most recent warming patterns could be costly to the nation. Small changes in global temperatures can lead to more extreme weather events including, droughts, floods and hurricanes.” Hurricane Katrina, which in 2005 destroyed much of New Orleans, may cost insurers as much as $60 billion. His is only the latest voice in a rising chorus of concern. The prestigious American Geophysical Union (AGU) is an apolitical international organization of scientists. Its 35,000 members include most of the foremost specialists who study both historical and current evidence of global climate change in the atmosphere, glaciers, oceans, forests and deserts. In a 1999 report, the AGU concluded that, "Greenhouse gases rising into the atmosphere from burning fossil fuels and other pollutants will increase the pace of global warming and disrupt many regions of the world. Those gases could persist in the atmosphere for thousands of years, and despite uncertainties about just how high worldwide temperature might go and how to combat the climate changes, new strategies must be developed to deal with the problem." In January 2005, Dr. Rajendra Pachauri, the chairman of the Intergovernmental Panel on Climate Change (IPCC), the international scientific body charged with establishing the science of climate change, told an international conference attended by 114 governments that the world has “already reached the level of dangerous concentrations of CO2 in the atmosphere,” and called for immediate and “very deep” cuts in emissions. He cited a multi-year study by 300 scientists showing that the Arctic was warming twice as fast as the rest of the world, and that its ice cap had shrunk by up to 20% in the past three decades. Remaining ice is 40% thinner than it was in the 1970s and is expected to disappear altogether by 2070. As he spoke, arctic temperatures were eight to nine degrees centigrade higher than normal. In April 2005, a NASA study demonstrated a rise in the temperature of the deep oceans that matched the predictions of computer models. Announcing the results, Dr. Jim Hansen, the chief scientist on the NASA study stated, “We have found the smoking gun. There can no longer be substantial doubt that human-made gases are the cause of most observed warming.” The study also found that the ocean is slowly releasing this stored heat, worsening the changes in climate already measured. Previously, skeptics claimed that the models linking human GHG emissions to observed changes in the temperature of the world’s atmosphere could not account for all of the warming that should be taking place, if the connection between human activity and climate change were as strong as some scientists claimed. Human activity has increased the CO2 content of the atmosphere by 20% in the last four decades, and today adds three times more annually than in 1960. The levels of CO2 have leapt abruptly over the past two years, suggesting that climate change may be accelerating out of control. Indeed, recent science has raised the concern that global warming may be happening faster than the models predicted; raising the threat that abrupt climate change could occur. This increases the urgency of corporate and municipal action. The International Energy Agency projects global emissions to climb another 60% by 2030. Many scientists now state that to stabilize climate, the world will need to reduce emissions of CO2 and other GHGs 60-80% below current levels. In June 2006, California Governor Arnold Schwarzenegger called for that state to achieve an 80% reduction by 2050. The United Kingdom had already pledged to implement such cuts and sees the economic feasibility of doing so. In October 2006 a report to the British Government concluded, “Global warming could cost the world's economies up to 20 per cent of their gross domestic product (GDP) if urgent action is not taken to stop floods, storms and natural catastrophes. . . Sir Nicholas told the Cabinet the world would have to pay 1 per cent of its annual GDP to avert catastrophe. But doing nothing could cost 5 to 20 times that amount. He told them: "Business- as-usual will derail growth.". . . The massive 700-page report - commissioned by the Chancellor, Gordon Brown - was described as "hard-headed" and "frighteningly convincing". It focused on the economic peril now confronting the world, unless action was taken to combat harmful CO2 emissions that contribute to global warming. The planet faces unprecedented perils. However, as described in the body of this manual, the answers exist and are cost effective. The problem is that we have failed so far to implement them. Stabilizing atmospheric CO2 levels will not be easy, but it can be done. Using a combination of energy efficiency and renewable energy, communities can shift from an economy based on hydrocarbons to one running on carbohydrates. All of the technologies exist to shift from coal and oil to much more benign sources of energy. In his book, Plan B 2.0: Rescuing a Planet Under Stress and a Civilization in Trouble, Lester Brown describes a policy to cut carbon emissions in half by 2015. An analysis by the German Environment Agency showed that world GHG emissions could be halved by 2050 at a cost of just 1% of global gross domestic product. Without action to restrain emissions, the cost of global warming-linked weather changes could cut 10% of world GDP. This Climate Protection Manual describes how you can implement such a plan. A stable climate is an important contributor to economic stability, but it is only one of the many services that intact ecosystems provide to our economy. Healthy ecosystems provide the provision of clean water, productive soils, the ability to detoxify society’s wastes and dozens of other services that we take for granted, but which we would sorely miss if they were to cease to function. Such scientists as Dr. Gretchen Daly and economists like Dr. Robert Costanza estimate that the economic value of the services that intact ecosystems provide to our economy is at least $30 trillion dollars a year, or the same as the entire value of the economy that is counted. None of this “capital” appears on conventional balance sheets, however, so “business as usual” treats these “ecosystem services” as having a value of zero. Because the way in which people around the world meet their needs does not make protection of the environment as a priority, every major ecosystem on the planet is in decline. The loss of the services that these ecosystems provide to us for free, will force businesses and communities to pay for replacements. This, of course, assumes that humans are even capable of creating substitutes for the contributions that intact ecosystems deliver. Lester Brown of the Earth Policy Institute points out that. "Accounting systems that do not tell the truth can be costly. Faulty corporate accounting systems that leave costs off the books have driven some of the world’s largest corporations into bankruptcy. The risk with our faulty global economic accounting system is that it so distorts the economy that it could one day lead to economic decline and collapse." In 1998, the American Museum of Natural History surveyed professional biologists. A striking 69% of them agree that we are living now through the “sixth extinction.” This species extinction seems to be happening more rapidly and affecting a wider range of biodiversity than any of the previous five. It is even faster than the last extinction, over 60 million years ago, when the dinosaurs disappeared. The scientists claim that we will lose between 30% and 70% of the planet’s biodiversity within a time span of only 20 to 30 years. The difference from all previous extinctions is that this one is due to the actions of one species—our own—the species that claims to be endowed with intelligence and consciousness. In April 2005, the United Nations released the Millennium Ecological Assessment. The study by 1,360 experts in 95 nations drew on the work of 22 national academies of science from around the world. It reported that a rising human population has polluted or over-exploited two-thirds of the ecological systems on which life depends, ranging from clean air to fresh water, in the past 50 years. “At the heart of this assessment is a stark warning,” said the 45-member board of the Millennium Ecosystem Assessment. “Human activity is putting such strain on the natural functions of Earth that the ability of the planet’s ecosystems to sustain future generations can no longer be taken for granted. “We simply must establish policies that require natural costs to be taken into account for all economic decisions,” he added. The Board of Directors of the Millennium Assessment stated: "The overriding conclusion of this assessment is that it lies within the power of human societies to ease the strains we are putting on the natural services of the planet, while continuing to use them to bring better living standards to all . . .Achieving this, however, will require radical changes in the way nature is treated at every level of decision-making and new ways of co-operation between government, business and civil society. The warning signs are there for all of us to see. The future now lies in our hands." There are two key resources that communities have taken for granted for at least a century: cheap fossil energy and the availability of sweet or sufficient drinking, water. There is a growing consensus that the availability and cost of these two vital resources are going to significantly change over the next few decades. They are both intimately wrapped up with the issue of climate change. Geologist M.K. 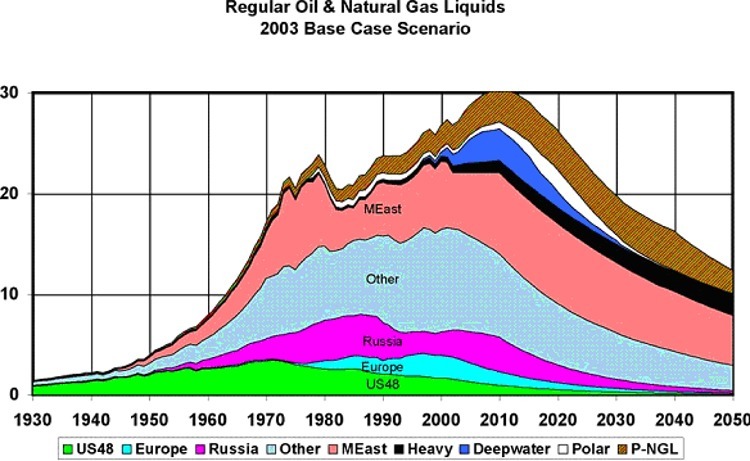 Hubbert, who worked for Shell Oil, predicted in the 1950s that the U.S. production of fossil energy would peak in the 1970s, and that world production would peak in the decade of 2010. This forecast was denied by the oil industry until recently. However, the U.S. production did peak during the 1970s, despite massive investment in exploration and new extraction techniques. Many signs indicate that Hubbert’s forecast will be true for the world as a whole. If Hubbert is right, and world oil production will peak in 2010, this is bad news for economies that depend on fossil fuels. Authors like James Kuntsler, in his book, The Long Emergency, predict that peak oil literally will result in the end of civilization, as we know it. The Department of Energy funded a study in 2005 that predicted peak global production in 2020, but it also stated that it would take us at least ten years to adjust so that we avoid unprecedented economic disruption. Recent price run-up in oil may be the beginning of this phenomenon. Whatever their cause, high and rising energy prices are already devastating many communities. They are also wreaking havoc on developing countries. Part of the reason that the world oil prices are now at record heights is that China has entered the world oil market. If the Chinese use oil at the same rate as Americans, and continue to grow their economy at their current rate, by 2031 China will need 99 million barrels of oil a day. The world currently extracts 89 million barrels per day and may not be able to lift more. Withdrawing oil too rapidly can cause fields to collapse, actually reducing the amount that can ultimately be extracted. It is not only liquid petroleum resources being tapped out. Though less often discussed, the U.S. also faces declining output of natural gas fields in the foreseeable future. Natural gas is often considered the transition fuel that will enable society to move away from dependence on more carbon intensive coal and oil. It is already in widespread use. Heating homes, producing electricity, agricultural fertilizers and pesticides, and numerous other products use natural gas. Demand for natural gas has increased nearly 200% in the past five years and has almost tripled in cost. Neither demand nor price for natural gas is expected to decrease any time in the near future. Moreover, it is very expensive to import from overseas in liquid form and we lack the port facilities to receive foreign shipments. Rising natural gas costs almost always translate into higher electricity costs, as most peak power generation across the U.S. comes from gas-fired combustion turbines or combined-cycle plants. Combined with the challenge of climate change, peak oil and gas is very worrisome for many communities. As far back as the 1950s, the Paley Commission of the U.S. government recommended an urgent transition to renewable energy. An increasing number of communities are deciding that the time has come to heed this advice. As described more below, there is a great deal that individuals and communities can do to extract themselves from the globalized energy market. Indeed, several cities have adopted “Peak Oil Resolutions,” including Franklin, New York, San Francisco, California, Portland, Oregon and Bloomington, Indiana. These resolutions call for a concentrated look at how the cities can prepare for the inevitability of sustained, higher oil prices. The Bloomington City Council acknowledges the unprecedented challenge of peak global petroleum production. The Bloomington City Council recognizes that the city of Bloomington must prepare for the inevitability of oil peak, and encourages the community to become better informed on energy-related matters. The Bloomington City Council supports the adoption of a global depletion protocol that will reduce petroleum use, conserving what remains, decreasing the likelihood of a rapid production decline, and lending predictability to supply and limiting market volatility. The Bloomington City Council directs the City Clerk to distribute this Resolution to the attention of the Congressional delegation, the Governor of the State of Indiana, and all members of the Indiana Statehouse, and urges them to take action on the impending peak in petroleum production and prepare for its consequences. Other cities will likely follow this lead. Preparing for higher energy prices and the multiple environmental, economic and health impacts of climate change seems unavoidable. Interestingly, the solutions communities can implement to come to grips with peak oil look remarkably like what a city would do to deal with climate change: energy efficiency and renewable energy. It is also interesting that these are the energy options now winning in the market. As described in more detail below, around the world, energy efficiency is the fastest growing way of meeting people’s needs for energy services, followed by using the sun to produce heat, followed by wind power, followed by solar electricity. In good sites, bringing wind on line costs less than running an existing coal or gas plant. A number of studies have shown that it will be possible for communities and countries to make the shift to renewable energy. An increasing number of homes are being equipped with solar electricity and heat. The country of Spain recently mandated that all new homes will be equipped with solar and that renovations must include solar, as well. It is not uncommon now to have homes that produce their own energy or interconnect to the grid at will. Individuals and communities are setting up small-scale biodiesel production facilities, using waste vegetable oil, or the output from special crops. The University of Colorado runs its bus fleet on biodiesel, and the program spun-off a for profit company to make the fuel. Biodiesel is also being co-produced with ethanol. In Brazil, 77% of new cars can run on locally produced ethanol, which supplies over half of the country’s need for vehicle fuel. Even poor communities like Curitiba, Brazil, have created public transportation systems that enable people to get everywhere they need to go and are affordable. Communities like Austin, Texas are encouraging “plug-in hybrid” vehicle programs. The long term initiatives section in Chapter 5 of this manual details programs that you can implement to increase the amount of renewable energy in your community. Far more challenging than shifting to renewable energy will be providing sufficient drinking, or “sweet,” water to all of the world’s population. Drinkable water, vital to businesses as well as individuals, has been taken for granted in modern society for many decades. Water scarcity, however, is already serious in many areas of the world and there is a growing consensus that it will become a critical issue for only more cities and countries. In 1999, the World Bank reported that 2 billion people, or 40% of the world’s population, lacked access to clean drinking water or sanitation. Worldwide demand for water is doubling every 21 years, more in some regions. Water supply cannot remotely keep pace with demand, as populations soar and cities explode. The report stated: "Population growth alone does not account for increased water demand. Since 1900, there has been a six-fold increase in water use for only a two-fold increase in population size. This reflects greater water usage associated with rising standards of living. It also reflects potentially unsustainable levels of irrigated agriculture. World population has recently reached six billion and United Nation’s projections indicate nine billion by 2050. What water supplies will be available for this expanding population?" In 2003, the United Nations Environment Programme released a report from 200 water experts around the world stating that within 50 years half of humankind will be living with water shortages, depleted fisheries and polluted coastlines. The severe water shortages that now affect people in 80 countries will affect 4 billion people by the middle of the century. Obviously, these trends interact with each other: global warming is likely to worsen droughts around the world. Proposed solutions like inter-basin water transfers and desalination require large amounts of energy. Overuse of water is worsening the loss of intact ecosystems. Thus, it is likely that any solution to these interrelated challenges posed in isolation will fail. Communities must start to consider all of these trends together, and put in place whole-systems solutions that solve many problems at once. Oil and water, of course, are only two resources. Similar challenges exist for all basic commodity resources. Inefficient resource use, the hallmark of Western economies since the First Industrial Revolution, will be a luxury unavailable to developing economies, as they seek to lift themselves out of poverty. They will not achieve their goals if they replicate industrialized countries’ inefficient use of resources. Doing this would require finding three more Earth’s worth of resources to meet the demands of the world’s consumers. By 2030, if China’s use of coal equaled current U.S. levels (nearly 2 tons per person), China would use 2.8 billion tons annually—more than the 2.5 billion tons the entire world now uses. Cement is already in short supply because of China’s demand, as is steel. Such resource constraints are likely to worsen, as growing and increasingly wealthy populations demand more stuff. The trends mentioned thus far are challenging and scary. As described below, there are also trends that are hopeful, and together with the rapidly emerging solutions to the more worrisome trends, offer an array of business opportunities. There exists a large and growing market in the U.S. and Europe for goods and services produced in ways that do not harm the environment or people. Approximately 30% of the adults in the U.S., or 63 million people place significant value on buying goods that do not worsen the trends mentioned above or that help to solve them. These individuals are part of a tectonic shift in consumer awareness and behavior. Research by sociologist Paul Ray found that this population comprises a growing market segment of educated consumers who make conscientious purchasing and investing decisions based on social and cultural values. Identified in a research report by Conscious Medium, this industry has been named “Lifestyles of Health and Sustainability,” or “LOHAS.” LOHAS consumers are driving a number of market changes by demanding goods and services that meet their desires to enhance health, environment, social justice, personal development and sustainable living. The growing sustainability movement, combined with the instant access to information that the Internet provides, has resulted in a more educated and discerning consumer than may have been apparent in past surveys of the general market. LOHAS is a worldwide market conservatively estimated at $228.9 billion, and growing. In the U.S., the market supporting what are called ecological lifestyles, including purchases of organic products, is at least $81 billion a year. The emergence of this market segment as a driver is unparalleled in U.S. history. These consumers will determine the future of many businesses. Some analysts are now calling the sustainability movement the largest phenomenon in human history. Hundreds of thousands of organizations throughout the world are working to achieve social justice, alleviate poverty, enhance standards of living for all and achieve environmental protection—in short, a more sustainable world. Click on the endnote number to return to text. Pew Center for Global Climate Change, http://www.pewclimate.org/hurricanes.cfm, 30 November 2006. Jim Lobe, “2005 Costliest Year for Extreme Weather”, Interpress Service, 7 Dec 2005. Available at, http://www.truthout.org/docs_2005/120705E.shtml, 30 October 2006. Thomas Atkins, “Insurer warns of global warming catastrophe,” Reuters, 3 March 2004. Munich re, website: http://www.munichre.com/, 19 July 2006. Dr. Andrew Dlugolecki, director of the CGNU, sixth largest insurance company in the world, in his report to the 6th Conference of Parties (COP 6) at the UN Framework Convention on Climate Change, 23 November 2000. See http://www.unepfi.org/fileadmin/events/2001/cop65/cc_unep_press_cop65_20010718.pdf , 30 October 2006. “Insurance Giant AIG Poised To Issue Climate Change Strategy,” 5 April 2006, Inside Green Business. NOAA web site: see http://www.noaanews.noaa.gov/stories/s412.htm, 18 April 2000. Los Angeles Times, “Hurricane Center Chief Issues Final Warning”, Williams, Carol, http://www.latimes.com/news/nationworld/nation/la-na-hurricane3jan03,1,7549657.story?coll=la-headlines-nation, 7 January 2007. Perlman, David “Warning of Impact of Global Warming: Scientists forecast economic disruptions.” San Francisco Chronicle (29 January 1999) pg A-4. Geoffrey Lean, “Global Warming Approaching Point of No Return, Warns Leading Climate Expert,” The Independent (U.K.), 23 January 2005. What makes Pachauri’s noteworthy is that he was put into his position by the Bush administration as a Chairman who would not make climate an issue. “A memorandum from Exxon to the White House in early 2001 specifically asked it to get the previous chairman, Dr. Robert Watson, the chief scientist of the World Bank, "replaced at the request of the U.S." The Bush administration then lobbied other countries in favor of Dr. Pachauri—whom the former vice-president Al Gore called the "let's drag our feet" candidate, and got him elected to replace Dr. Watson, who had repeatedly called for urgent action.” Global Warming Approaching Point of No Return, Warns Leading Climate Expert By Geoffrey Lean, The Independent on Sunday U.K, 23 January 2005. J. Hansen, et al, “Earth’s Energy Imbalance: Confirmation and Implications,” Science magazine, Vol. 308, 3 June 2005, p. 1431. See http://pubs.giss.nasa.gov/abstracts/2005/Hansen_etal_1.html, 30 October 2006. The article stated that the climate model, driven mainly by increasing human-made greenhouse gases and aerosols among other forces, calculates that Earth is now absorbing 0.85±0.15 W/m2 more energy from the Sun than it is emitting to space. This imbalance is confirmed by precise measurements of increasing ocean heat content over the past 10 years. Implications include: (i) expectation of additional global warming of about 0.6°C without further change of atmospheric composition; (ii) confirmation of the climate system's lag in responding to forces, implying the need for anticipatory actions to avoid any specified level of climate change; and (iii) likelihood of acceleration of ice sheet disintegration and sea level rise. Reuters, “WMO Sees Link Between Global Warming and Hurricanes,” http://www.planetark.com/dailynewsstory.cfm/newsid/35795/story.htm, 27 March 2006. WorldWatch Institute, Vital Signs 2003. Molly O. Sheehan wrote "Carbon Emissions and Temperature Climb," pp. 40-41. In this section there is a chart called "Global Average Temperature and Carbon Emissions from Fossil Fuel Burning, 1950-2002, and Atmospheric Concentrations of Carbon Dioxide, 1960-2002." New Scientist.com, http://www.newscientist.com/article.ns?id=dn443, 01 February 2007. Geoffrey Lean, “Global Warming Approaching Point of No Return, Warns Leading Climate Expert,” The Independent, (U.K.) January 23, 2005.
 International Energy Agency, “World Energy Outlook 2004,” published October, 2004. www.iea.org, 30 October 2006. Carolyn Marshall, The New York Times, 1 June 2005. Andy McSmith, Colin Brown, Climate change: US economist's grim warning to Blair's Cabinet, 27 October 2006, http://news.independent.co.uk/environment/article1932727.ece. Excerpted from Chapter 10, “Stabilizing Climate,” in Lester R. Brown, W.W. Norton & Company, 2006. Costanza, Robert and Carl Folke. 1997. “Valuing Ecosystem Services with Efficiency, Fairness, and Sustainability as Goals, in Gretchen Daily, ed., Natures Services: Societal Dependence on Natural Ecosystems, Island Press, Washington, D.C., pp. 49-68, William K. Stevens, "How Much Is Nature Worth? For You, $33 Trillion," New York Times, 20 May 1997. Earth Policy Institute, http://www.earthpolicy.org/Books/Seg/PB2ch12_ss2.htm, 11 September 2006. Union of Concerned Scientists, http://www.worldtrans.org/whole/warning.html, 11 September 2006. Janet Larson, The Sixth Great Extinction: A status report, Earth Policy Institute, March 2004 http://www.earth-policy.org/Updates/Update35.htm, 30 October 2006. Millennium Ecosystem Assessment, www.maweb.org/, 30 October 2006. “The State of the World? It Is on the Brink of Disaster”, The Independent UK, Wednesday 30 March 2005, http://www.independent.co.uk/c/?ec=500, and http://www.truthout.org/cgi-bin/artman/exec/view.cgi/34/10059, 30 October 2006. Hubbert Peak of Oil Production website: www.hubbertpeak.com/hubbert, 13 September 2006. James Kuntsler, The Long Emergency, Grove Press, 2006. Department of Energy, Peaking of World Oil Production: Impacts, Mitigation & Risk Management, Feb. 2005. http://www.netl.doe.gov/publications/others/pdf/Oil_Peaking_NETL.pdf, also archived at, www.climatemanual.org/Cities/Chapter8/DOE_peakoil.pdf, 26 September 2006. 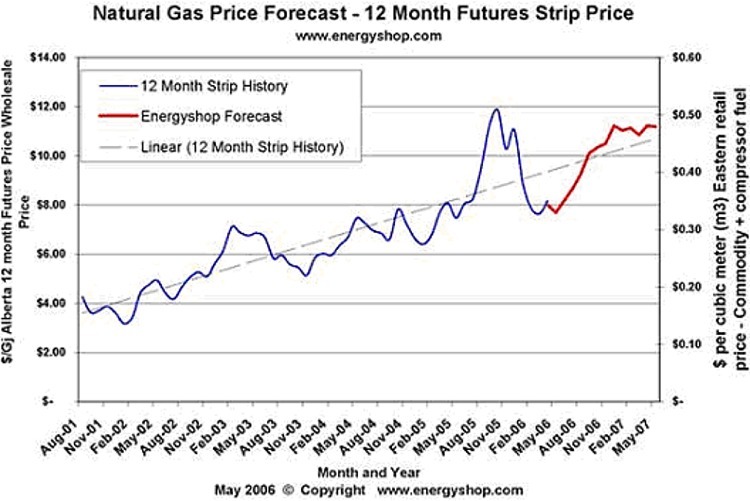 Energy Shop, website: http://www.energyshop.com/es/homes/gas/gaspriceforecast.cfm, August 23, 2006. Stefan Wagstyl, “Cheney rebukes Putin on energy ‘blackmail’,” Financial Times, http://www.ft.com/cms/s/25eb1452-db62-11da-98a8-0000779e2340.html, 4 May 2006. Post Carbon Institute, website: www.postcarbon.org/, 11 September 2006. Post Carbon Institute, http://www.postcarbon.org/involved/resolution, 20 July 2006. City of Bloomington, Indiana, website: http://bloomington.in.gov/egov/docs/1153747651_559687.pdf, also archived at, www.climatemanual.org/Cities/Chapter8/Bloomington.pdf, 20 July 2006. List studies, For a discussion of this see Lovins, Lovins, Brittle Power, Chapter 17, http://www.natcapsolutions.org/publications_files/brittlepower.htm, 30 October 2006. Earth Policy Institute, Eco-Economy Indicators, www.earth-policy.org/Indicators/2004/indicator12.htm, 30 October 2006. Reuters News Service, “Spain Makes Solar Panels a Must on New Buildings,” http://www.planetark.com/dailynewsstory.cfm/newsid/38965/story.htm, SPAIN, 14 November 2006. Collaborative Biodiesel Tutorial, www.biodieselcommunity.org/, 30 October 2006. BBC News, “Brazil's Alcohol Cars Hit 2 Million Mark”, Friday 18 August 2006. Arizona Water Resource, http://cals.arizona.edu/AZWATER/awr/dec99/Feature2.htm, 11 September 2006. USA Today, Water Shortages Will Leave World in Dire Straits, By Dan Vergano, http://www.usatoday.com/news/nation/2003-01-26-water-usat_x.htm, 11 September 2006. Hawken, Lovins, Lovins 1999, Natural Capitalism, Little Brown, P. 107-124. Global Footprint Network, http://www.footprintnetwork.org/, 30 October 2006. “Learning From China, Why the Western Economic Model Will not Work for the World”, www.earth-policy.org/Updates/2005/Update46.htm, Lester R. Brown, March 9, 2005. 2006 saw cover stories on the Green Trend in such mainstream magazines as Newsweek, Time, Vanity Fair, Elle, Fortune, Wired, Business Week and others. "Carbon neutral" was the New Oxford American Dictionary "word of the year," http://blog.oup.com/oupblog/2006/11/what_do_al_gore.html. LOHAS website, http://www.lohas.com/about.htm, 11 September 2006. Ray, Paul, and Anderson, Sherry, The Cultural Creatives, Three Rivers Press (October 2, 2001) ISBN: 0609808451. LOHAS website, http://www.lohas.com/about.htm, 30 October 2006. Paul Hawken, Natural Capital Institute, http://www.naturalcapital.org/Projects.html, 30 October 2006.